This is the second of a 2-part post on using bit.ly. Part 1 – Bit.ly for Beginners – explained the basics of Bit.ly. 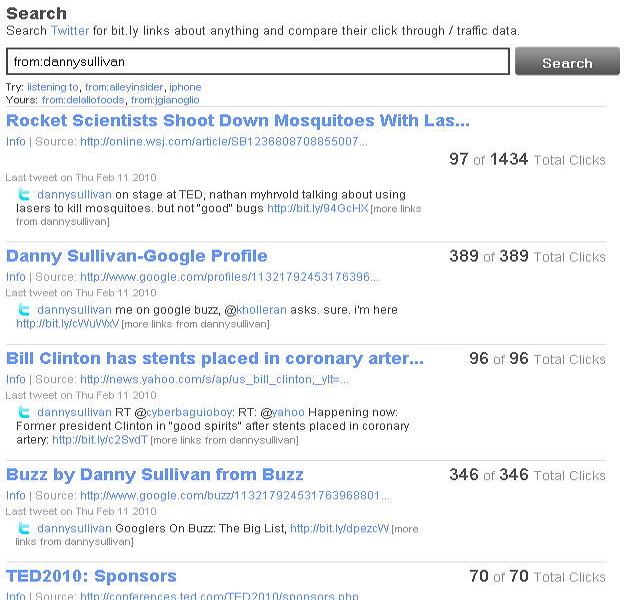 Just for fun, you can see how many clicks that Bit.ly link received by going to http://bit.ly/dwSQo4+ (notice the plus sign at the end). Are your wheels spinning yet? 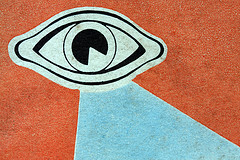 You have a competitor that you keep tabs on, right? Maybe you have a Google Alert set up for their name, or maybe you follow them on Twitter (and monitor social media mentions of their name or product). Now you can track how effective they are at leveraging social media and see if specific campaigns they are running are having success. Or you can compare your own campaigns to theirs to see how you stack up. There are two ways to do this. 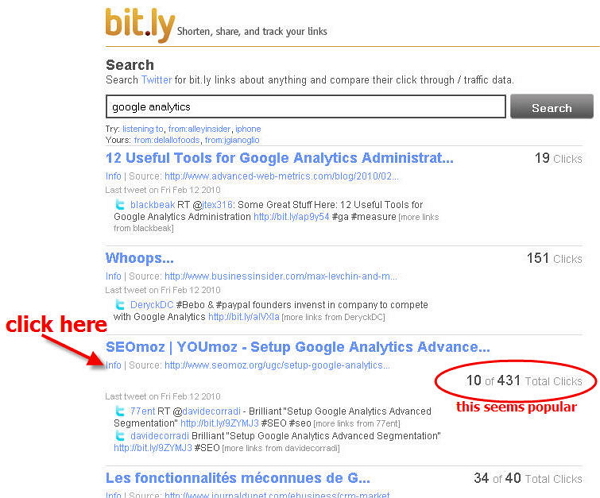 The first way is if you can find Bit.ly shortened links to your competitor’s pages. You might find these in their Twitter stream or on their Facebook fan page, or maybe you see someone else mention your competitor’s site with a Bit.ly link. Just take that Bit.ly URL and add the “+” (like mentioned above). Instant gratification! You can see how many clicks they’ve received, how many people have retweeted or shared the short URL and the conversations surrounding the link. If your competitor has a Twitter account, you can also go to Bit.ly Twitter search and do a search for from:twitterusername – here’s an example. But I’m getting ahead of myself. If your competitor doesn’t Tweet or you can’t find any Bit.ly links to their pages, you just have to do some more reconnaissance. Find out which pages on your competitor’s site are the most popular. You can use a tool like Top Pages from SEOmoz (Pro Membership required) or search Google for site:yourcompetitor.com – along with the SEO for Firefox plugin (to quickly see the most linked to pages). Take the pages that are the most popular (i.e. most linked to) and shorten them yourself using Bit.ly. You’ll quickly see if anyone else has shortened that same URL, and if so, all the traffic information along with it. 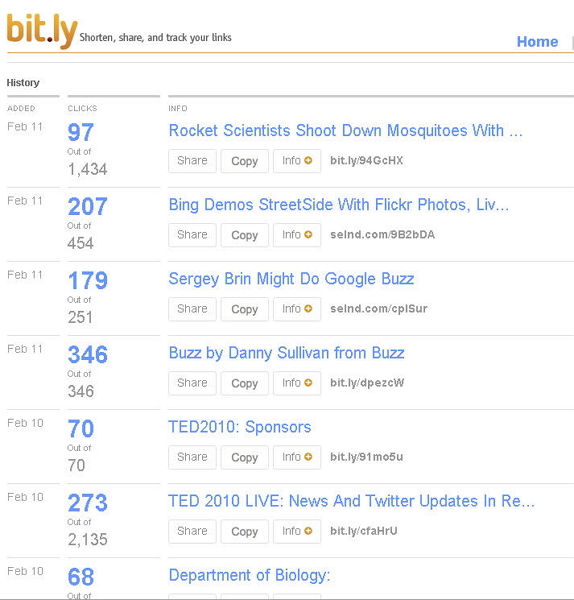 Let’s visit Bit.ly Twitter search again, this time with our link building hats on. This nice Bit.ly feature, although somewhat hidden, lets you search Twitter for Bit.ly links about anything and compare their click through and traffic data. For example you can do a search for a topic like Google Analytics and get a quick glimpse at what Google Analytics-related content has been popular recently. Now just scroll down a bit and look at the “Conversations.” You should find plenty of Twitterers who have shared a post on a similar topic as yours. Chances are, they’ll be willing to share yours too, if it’s good. All you have to do is let them know about it. Don’t believe the numbers you see on Twitter. Just because someone has 10,000 followers doesn’t mean that they’re popular or that anyone is listening to them. In a lot of cases, they’re just using shady techniques to get a lot of followers to make themselves look good. These are not the people you want to target to help spread the word about that awesome article you just wrote. But how do you find those people with influence? These are people that, regardless of the number of Twitter followers they have, can get a lot of people to click on links that they tweet and retweet. I’d rather have someone with 500 followers tweet a link to my post (if 10% of their followers regularly click through and retweet) than someone with 5,000 followers, who can only get a 0.1% click through rate and no retweets. Here’s a good example – you’d think that with nearly 7,000 followers, this twitterer would be able to get more than a handful of people clicking on his links. C’est la vie! So how do you find these influencers? There are some tools out there to guage a twitterer’s influence, like TweetStats and Twitalyzer, that arguably do a better job of this type of analysis. However, Bit.ly can give you a more detailed look at which posts/tweets a person was able to attract a lot of attention to. This is good, but we can do better. If you click “info” on one of the results to get the details, you’ll see that Danny is a registered user of Bit.ly. 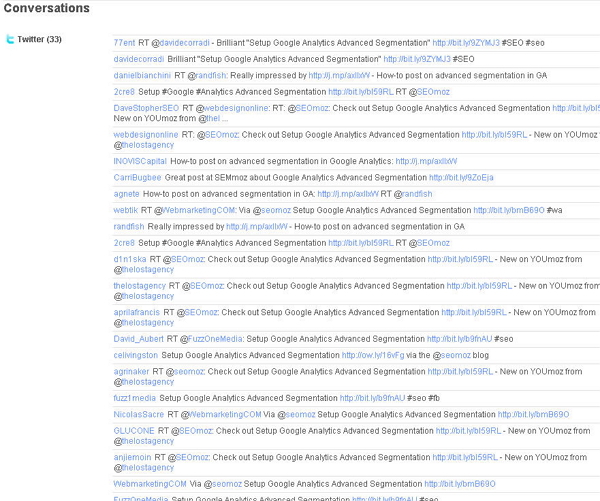 If you click on the user name, you’ll get all of the Bit.ly shortening history. So we can see that Danny does have a lot of influence, which is no real surprise. All of the above information is great, but it’s limited to the people who use Bit.ly it to shorten their links. Although Bit.ly is on of the most used shorteners, there’s certainly no shortage of options – is.gd, kl.am, tinyurl, cli.gs, ow.ly, goo.gl, etc. Also, just because someone uses Bit.ly to shorten their links, doesn’t mean that they’re a registered Bit.ly user. A lot of apps (TweetDeck, twitterfeed, etc.) integrate Bit.ly to shorten links. This means you won’t be able to determine a person’s influence as easily through Bit.ly, like we saw above with Danny Sullivan.